Our product range includes a wide range of fully automatic circular saw machine, metal bandsaw machine ac-2 hs, automatic bandsaw machine ac-250, automatic horizontal metal cutting bandsaw machine ac-1-hs, horizontal bandsaw machine ac-3 hs and semi automatic horizontal bandsaw machine ac-4-hs. We are engaged in manufacturing an excellent range of METAL CUTTING CIRCULAR SAW Machines, which is designed using optimal grade raw material. In order to cater to the varied needs and requirements of METAL CUTTING industries, we offer them customization for our product range as per their specifications. Endless Circular 0.9 mm blade, so it has less material wasteage. Blade has circulating movement & move in one direction only. In one Cycle time, the blade has continuous cutting so no ideal stroke. Less power consumption due to continuous cutting. Arm has swing type action for smoother & faster cutting of larger section. 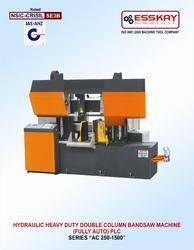 Efficent self-centering vice for job clamping. Easy-Precise & adjustable gavity feeding control. Each & every parts of the machine is easily repairable & replaceable. Hydraulic Lock & Pressure Regulator. Auto Saw frame Height Adjustment. Complete Electric system & servo system. PLC Control for all Electric & Hydraulic Function. Carbide &m Roller blade Guide for long life accurate Cutting. A.C. Drive for infinitely variable speed control. Variable vice Pressure for thin walled job. Endless Circular 0.9mm Blade, so it has less material waste. Blade has circulating movement & moves in one direction only. 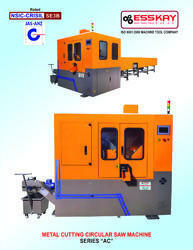 In one cycle time, the blade has continuous cutting and no idle stroke. So less cutting time due to blade is always in cointact with the material & moving in one direction only. Less power consumption due to continuous cuttimg. Makes optimum use of bandsaw blade , since it has been re-welded so many times. Each & every parts of the machine is easily repairable & replacement. Hydraulics lock & presser regulator. 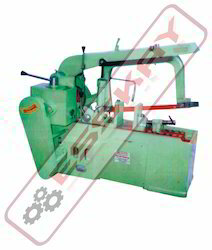 We offer an extensive array of Hydraulic Hacksaw Machine Precision, which is fabricated using superior grade raw material, that is in compliance with the industry norms. 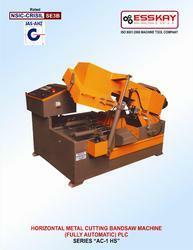 Furthermore, we use the latest techniques and methods to manufacture our range of Hydraulic Hacksaw Machine Precision. 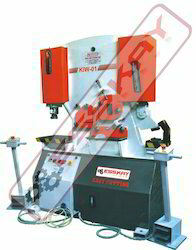 These Hydraulic Iron Cutter machines are precision engineered using the latest techniques and machinery so that our products can be used in various industrial applications. Furthermore, we offer customization for our range to meet the desired specifications of the clients across the globe. Our machines are corrosion resistant, robust in construction and easy to install. 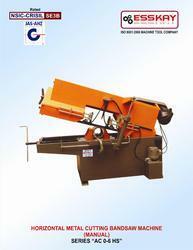 We have been involved in manufacturing, exporting and trading a comprehensive range of Hydraulic Hacksaw Machine. 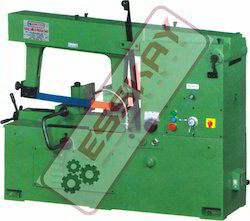 Fabricated using high grade raw material, our range of hydraulic hacksaw machine-regular can be customized to meet the rising demands and preferences of the global clients. Furthermore, we stringently test our product range on several parameters so as to stay at par with the international quality standards.